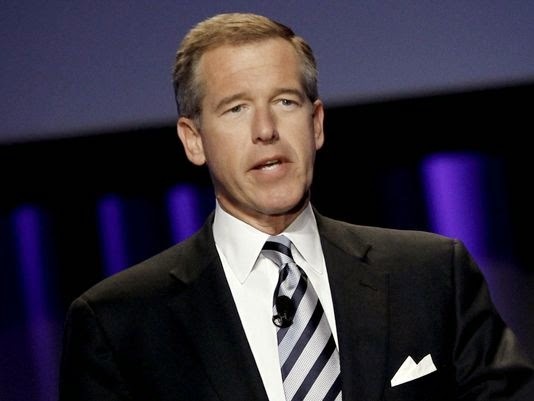 Brian Williams, the NBC News chief anchor has been the focus of an uproar over his false account of a decade-old incident during the Iraq war. Williams had on Wednesday recanted a story that he was in a helicopter in Iraq that was hit by enemy fire and forced to land back in 2003. Today, he has issued a statement saying he would be going off the air "for the next several days"
Williams wrote in a personal note posted on the NBC News website that fellow anchor Lester Holt would be taking over during the unspecified time period. "In the midst of a career spent covering and consuming news, it has become painfully apparent to me that I am presently too much a part of the news, due to my actions. As Managing Editor of NBC Nightly News, I have decided to take myself off of my daily broadcast for the next several days, and Lester Holt has kindly agreed to sit in for me to allow us to adequately deal with this issue. Upon my return, I will continue my career-long effort to be worthy of the trust of those who place their trust in us." "This has been a difficult few days for all of us at NBC News.Yeste rday, Brian and I spoke to the Nightly News team. And this morning at the Editorial Exchange, we both addressed the wider group. Brian apologized once again, and specifically expressed how sorry he is for the impact this has had on all of you and on this proud organization."